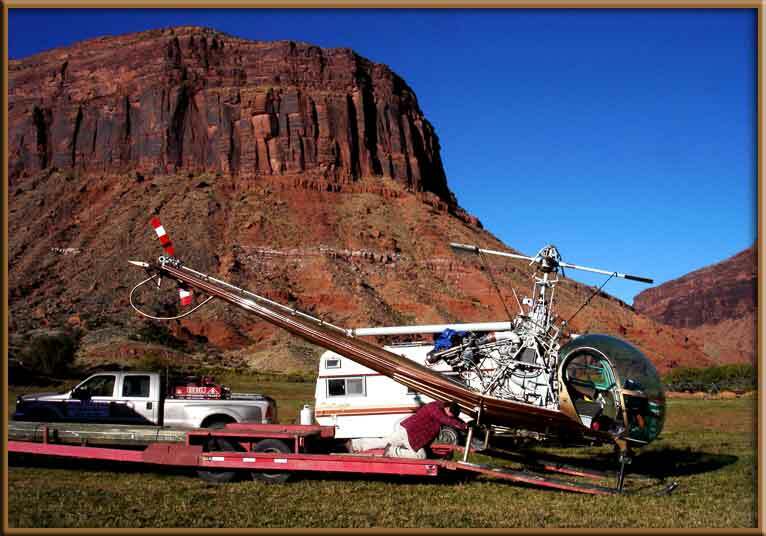 For jobs more than 200 air miles from Vernal, Utah we OFFER to Trailer the Helicopter to the airport nearest your job site for a Fraction of the Cost of flying the helicopter to your job site from our Base of Operations in Vernal Utah. 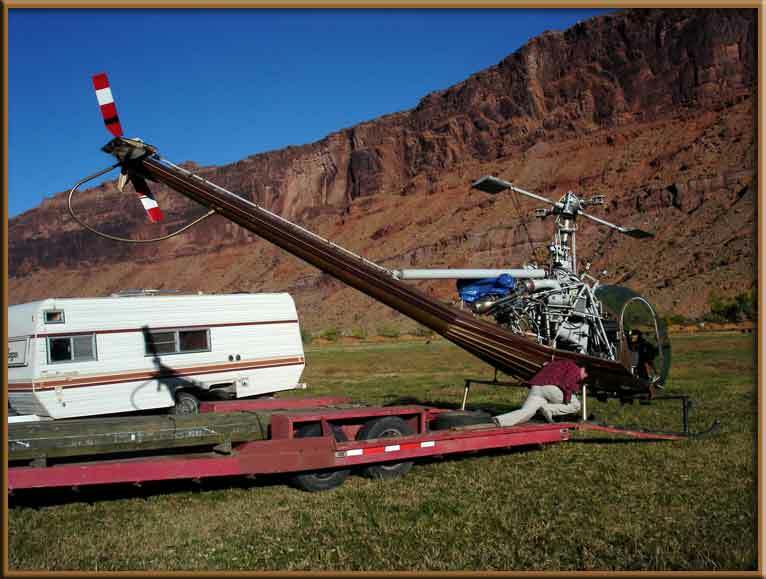 The COST to Trailer the Helicopter to and from our Customer's job site, is based on the Highway Mileage and on the number of Helicopter Hours Guaranteed on the job by our Customer(s). 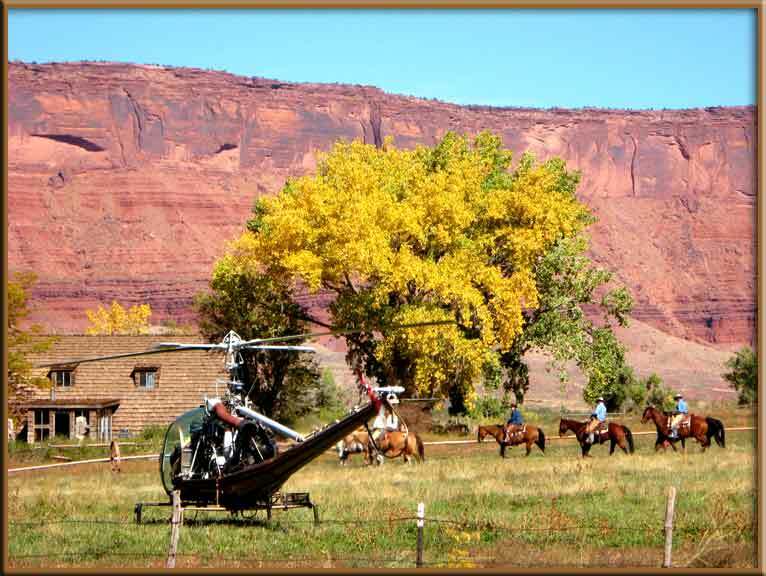 Our Standard Helicopter Trailering Rate is $5.00 per Highway Mile. 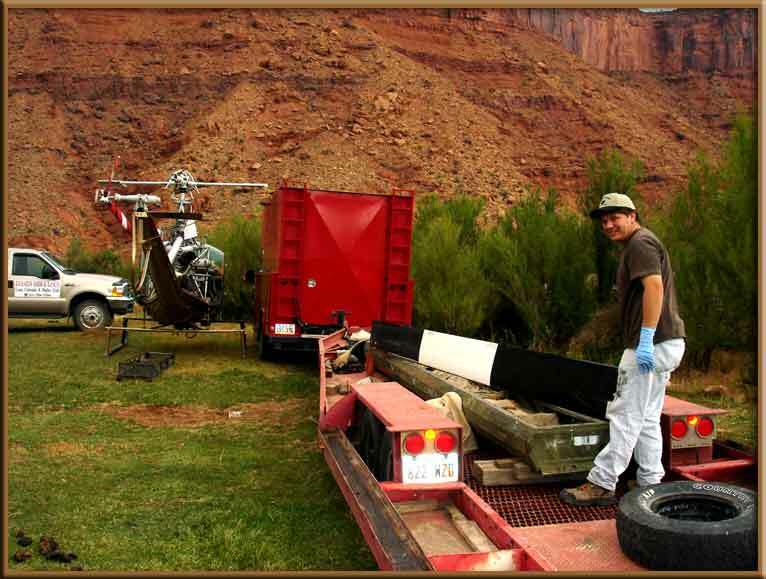 We require a 40 Hour Minimum Helicopter Service job in order to trailer the Helicopter to and from your Job Site ANYWHERE in the Western United States. Helicopter Trailering on Paved Highways only. 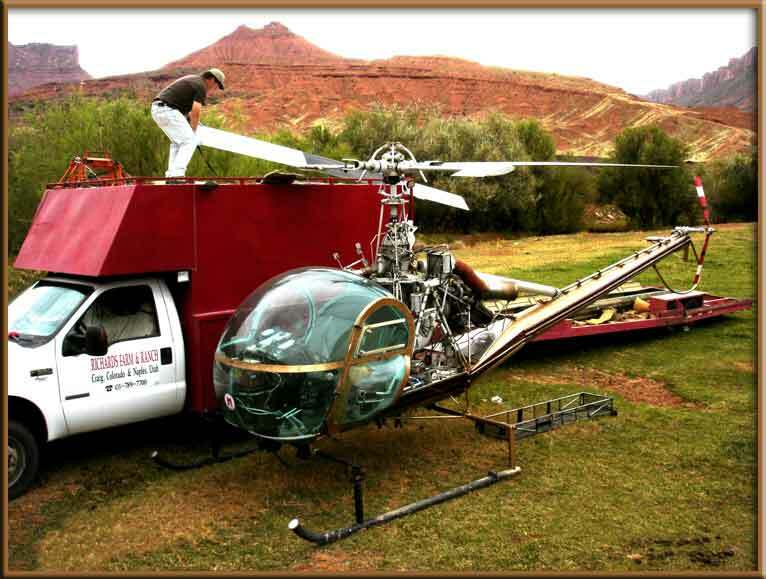 We normally trailer the helicopter to the airport nearest your job. 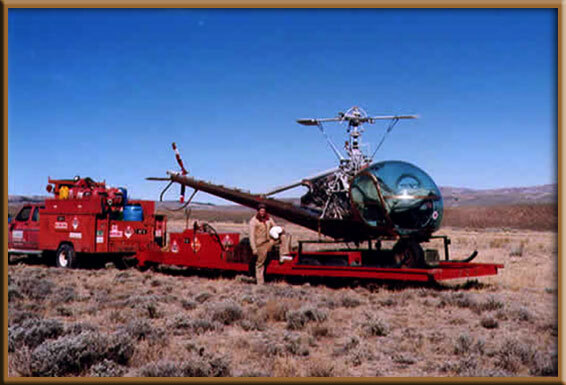 Removing the Main Rotor Blades and placing them in their container and Loading the Helicopter onto the Trailer requires Several Hours, in addition to the Travel Time. If we Trailer the Helicopter to your job, we will need at least two days notice. 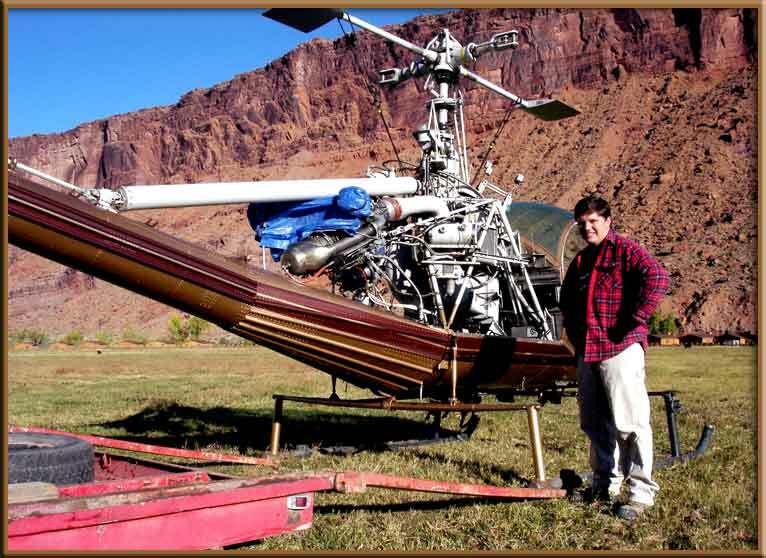 Upon arrival at the job, under the authority of our FEDERAL AVIATION ADMINISTRATION MECHANIC CERTIFICATE, the Main Rotor Blades are reinstalled and the helicopter is INSPECTED and Returned to Service with the proper Log Book Entries. A Test Flight must be conducted before passengers and/or cargo may be flown. 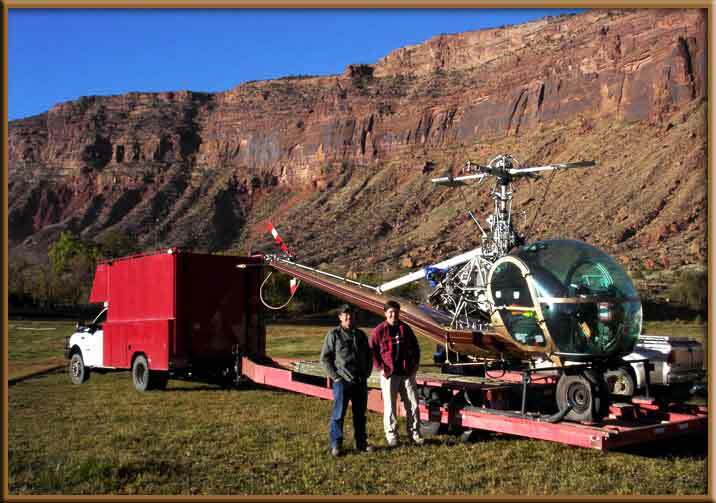 Having the helicopter transported by trailer saves our customers Thousands of Dollars in helicopter flight time TO and FROM your Job! Our One Ton Diesel Service/Fuel Trucks pull the Helicopter Trailer to our customer's job site, and also deliver 600 Gallons of Helicopter Fuel. We can then provide up to 25 Hours of on-site Helicopter Service before returning to an airport for more Helicopter fuel. Helicopter Fuel and Helicopter Tools and Spare Parts are kept Safe and Secure inside the Locked Cabin of our Field Support Fuel Truck which pulls the Helicopter Trailer to our Customers' Job Locations. 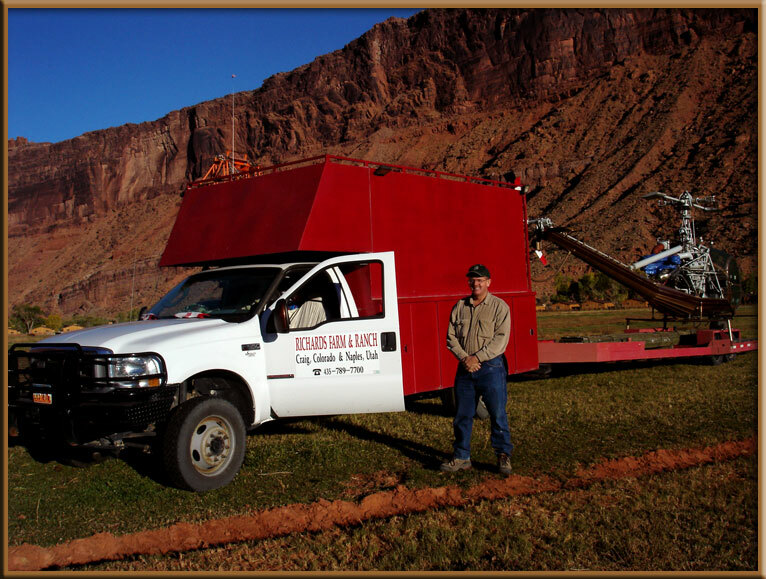 When we trailer the Helicopter to a Job Site, we normally dispatch a Second Fuel Truck to pull a Camp Trailer to the job so that we can be available to serve our customers from dawn until dusk. Your Pilot, James Richards preparing to unload the Helicopter in the photo above. 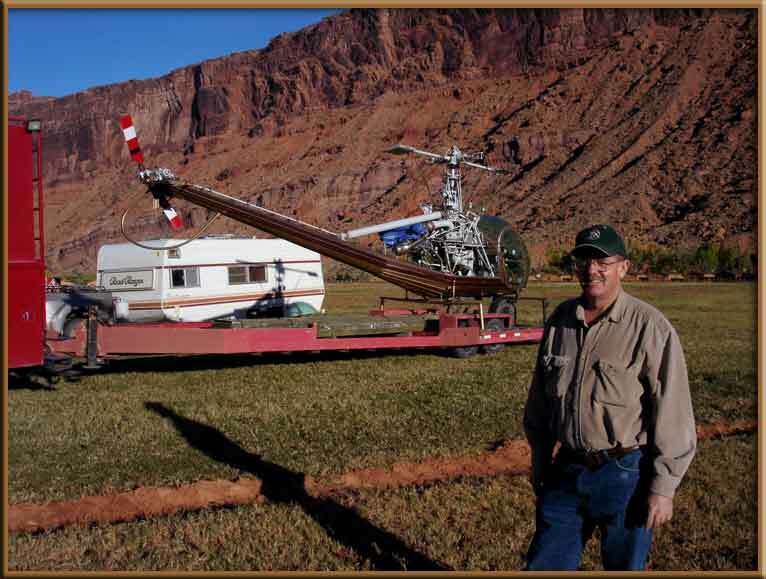 The slide ramps are installed on the trailer and the helicopter is pushed off. 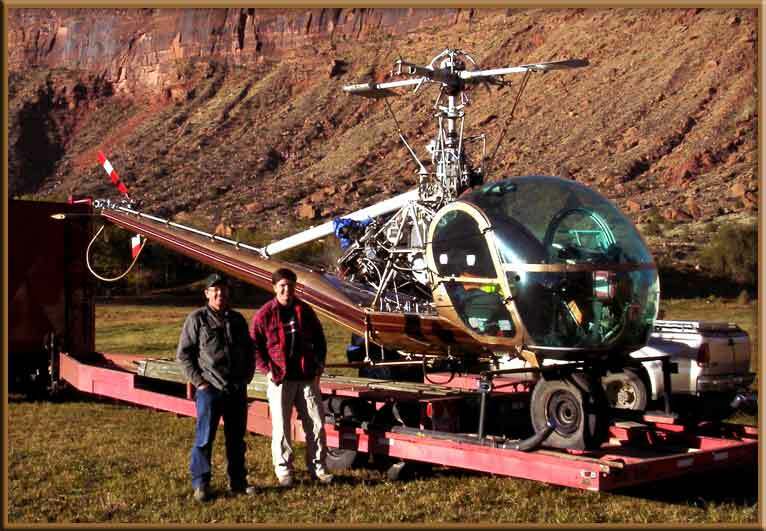 After trailering the helicopter to a Job Site, the mechanic does a Complete Airframe Inspection before the Main Rotor Blades are installed. 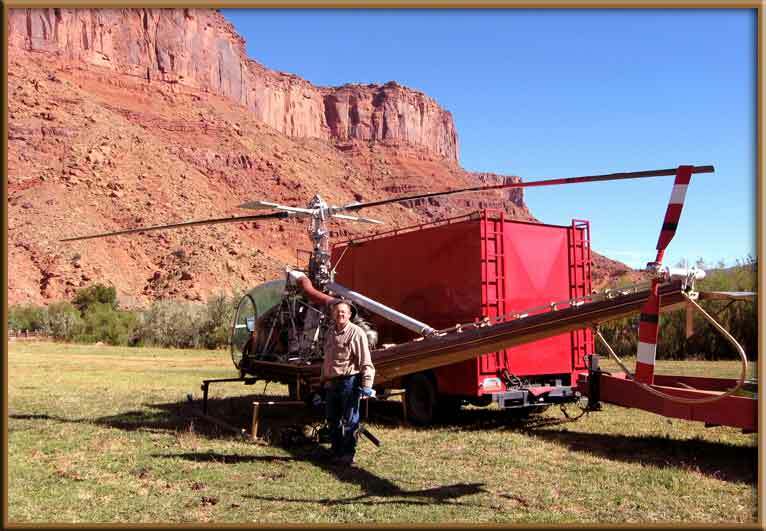 Office Manager and Fuel Truck Driver Ben Hacking helps prepare the helicopter for Return to Service in the photo above. The Main Rotor Blades are stored in a metal military surplus Rotor Blade Box for Transportation. The Main Rotor Blades are unloaded with the Greatest of Care, then they are cleaned and inspected. Two men carefully hoist the Main Rotor Blades to the top of the Service Truck Cabin where they are inserted into the Main Rotor Blade Fork. The Main Rotor Blade attaching bolts are installed and torqued to the correct limit. A final pre-flight inspection is performed by the Mechanic. A test flight is then conducted and the proper logbook entries are made. The Helicopter is now Returned to Service at the Customer's Job Site. 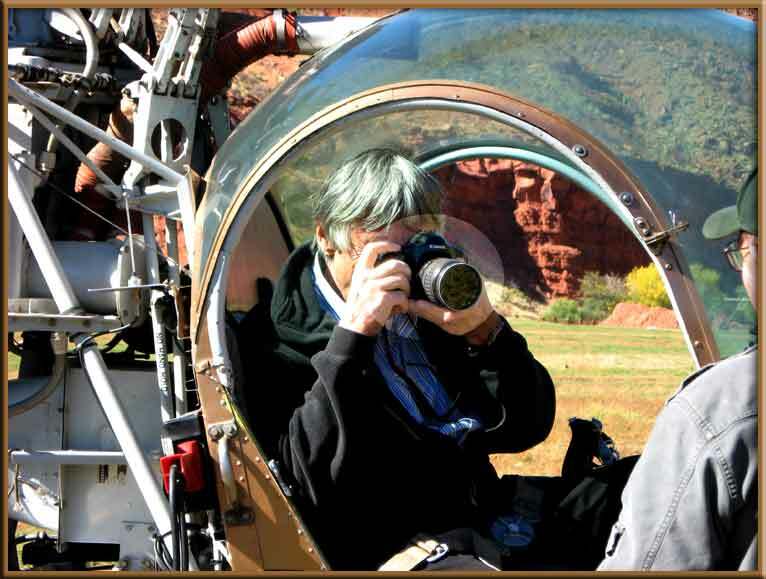 On this job in the Moab, Utah area, the Photographer Passenger participates in a "Pre-Flight Safety Briefing" as required by the Federal Aviation Administration (FAA). 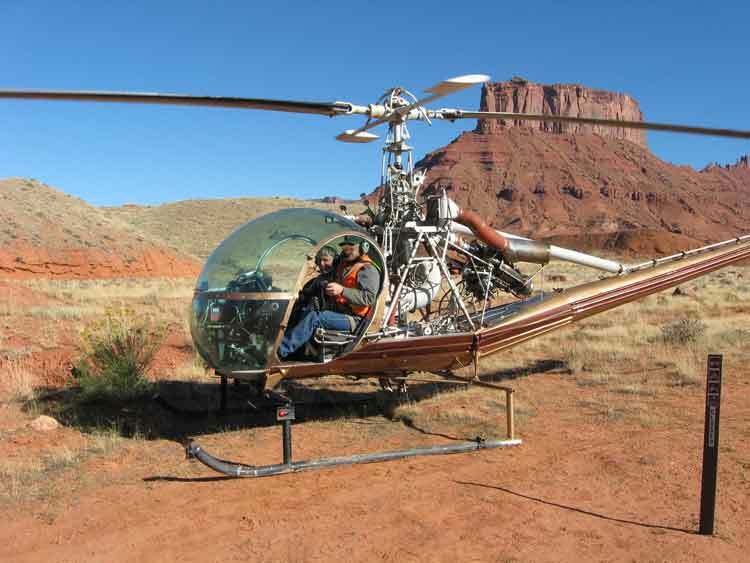 In this "Cowboy Photo Shoot" the Photographer directs the Helicopter into Position in order to obtain the Perfect Photo. 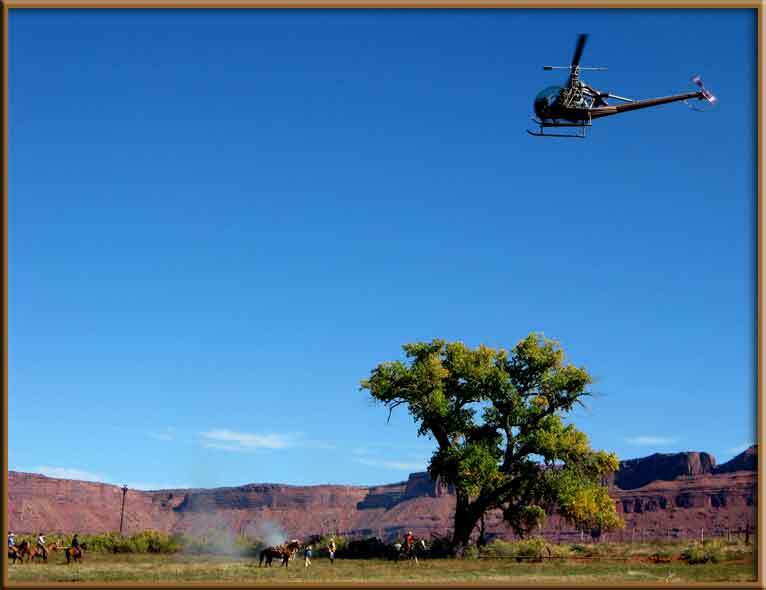 Using the Intercom Headsets, the Photographer directs the Pilot to position the Helicopter for more photos of the Cowboys and Horses. 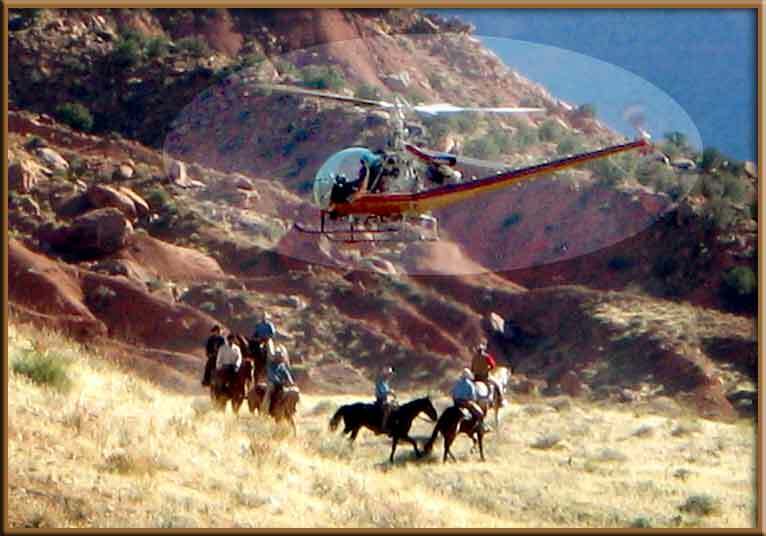 The quiet performance of the Hiller Soloy allows the Pilot to position the helicopter close to the Horses and Cowboys as directed by the Photographer. The Helicopter must be Refueled approximately every Two Hours, therefore we normally dispatch the FUEL TRUCK to meet the Helicopter in the filed. FM Communication Radios are installed in both the Helicopter and the FUEL TRUCK to coordinate refueling sites. We have PROGRAMMABLE F. M. Communication Radios in both the Helicopter and Service Trucks. The radios can be programmed to our Customers F. M. radio frequency. We issue our Customers and their Ground Personnel Hand Held FM Communications Radios and High Visibility Orange Vests. Radio Communication with our Customers on the ground is the key to an efficient operation. 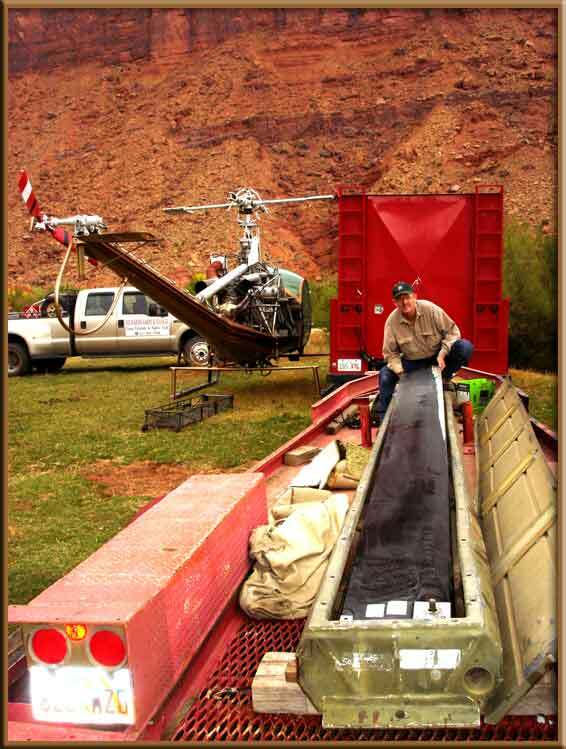 When the job is completed, the Main Rotor Blades are removed and placed in the Metal Container. 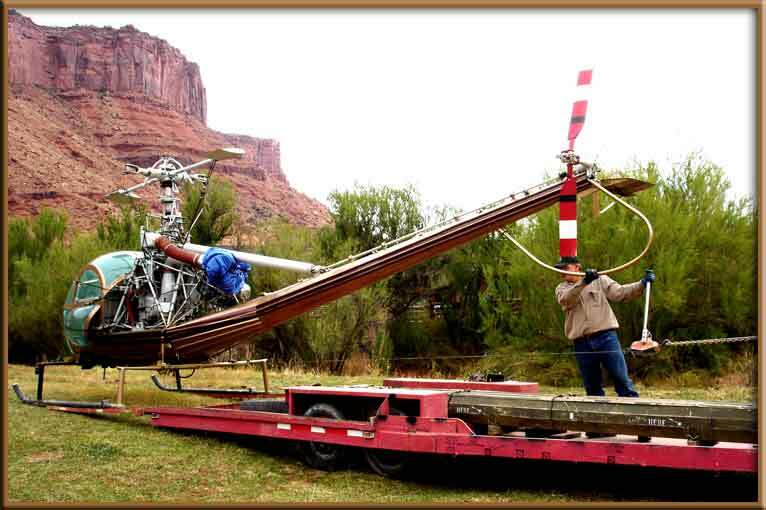 The Helicopter is then carefully Hand Wenched up the Slide Rails onto the Trailer. The Main Rotor Head is Blocked and Secured and the Engine Cover installed while preparing to trailer the Helicopter back to our Base of Operations. All the Helicopter Support Supplies are secure and safe inside the Locked Cabin of the Fuel/Service Truck. 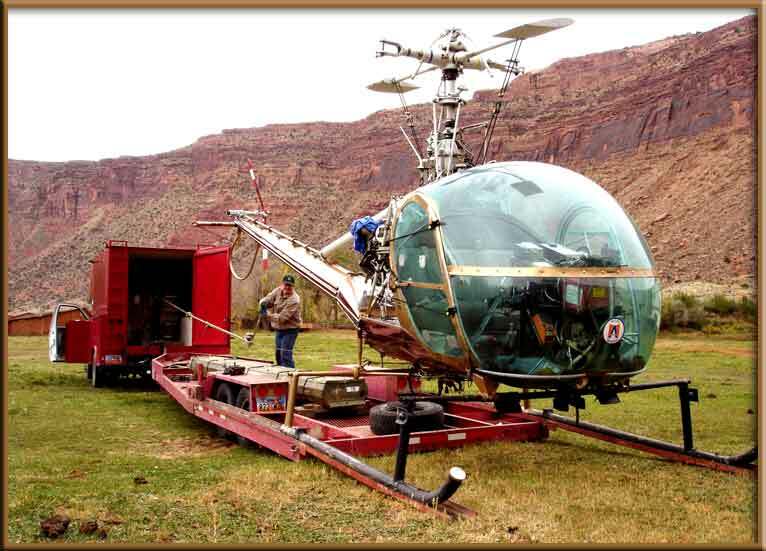 With the Helicopter Loaded onto the Trailer, the Pilot and Mechanic are prepared to drive back to Vernal, UT. Another Satisfied Customer at the end of another Exciting Day of High Adventure!